WordPress is undeniably the most popular CMS in the web. No wonder most entrepreneurs and organizations use WordPress in their online business. As a matter of fact, search engines are more attracted to WordPress websites. That means websites powered by WordPress are more likely to have better page rankings. Yet, that is just one of the major advantages of using WordPress as your Content Management System. Today, we have collected 40+ Best Free Responsive WordPress Themes 2017 that you can freely download for your next blog/magazine, portfolio, online store or any other site. 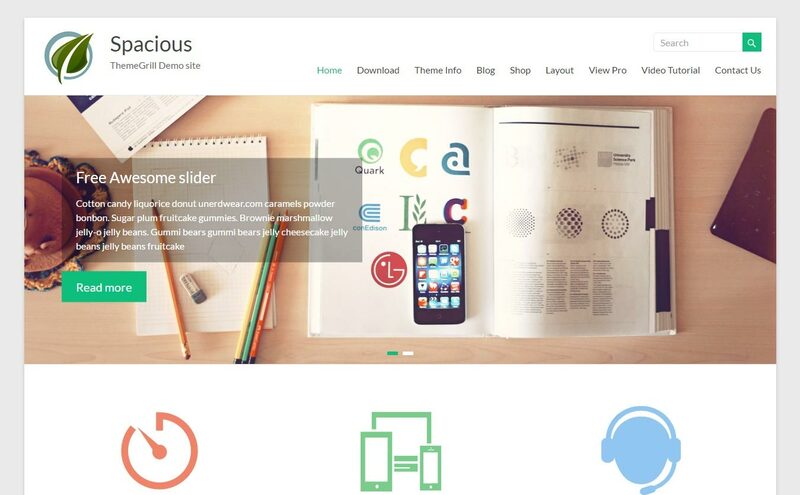 These WordPress themes are crafted beautifully and are 100% free. You may check the theme’s license for more information about the usage. These 40+ Best Free Responsive WordPress Themes 2017 are developed with awesome design and excellent functionality. This collection varies from blog/magazine, portfolio, photography, online store, restaurant and café and a lot more! So, if you have been looking for a free WordPress theme for your business, check this list now! 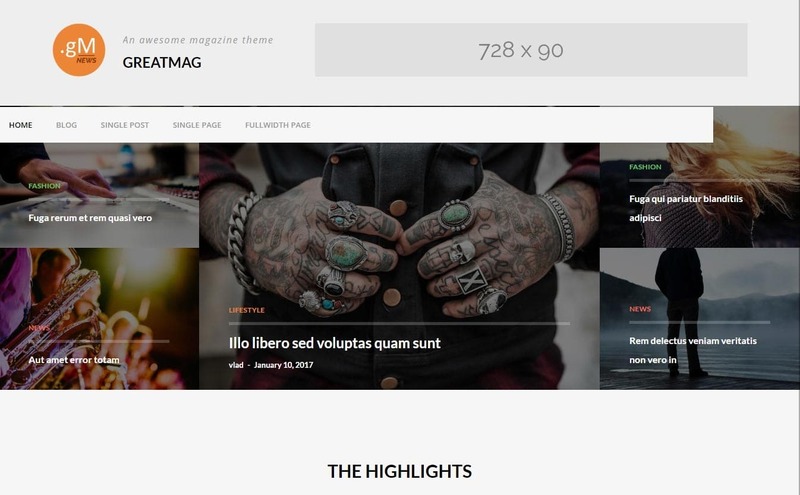 GreatMag is a responsive WordPress theme ideal for magazine. It has a modern design that comes with bunch of custom widgets, color options and many more. 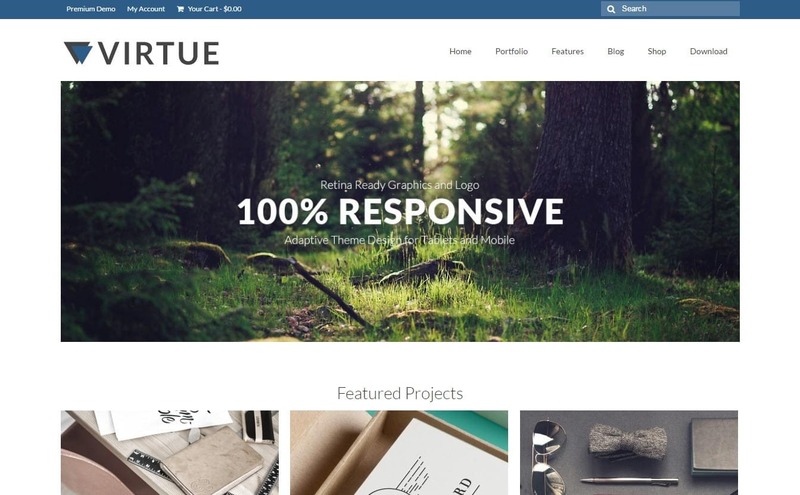 Virtue is a responsive WordPress theme suitable for freelancers, agencies and other artists. Virtue has a clean and modern design that you would. The theme is Woocommerce integrated so you can easily operate a online shop anytime. 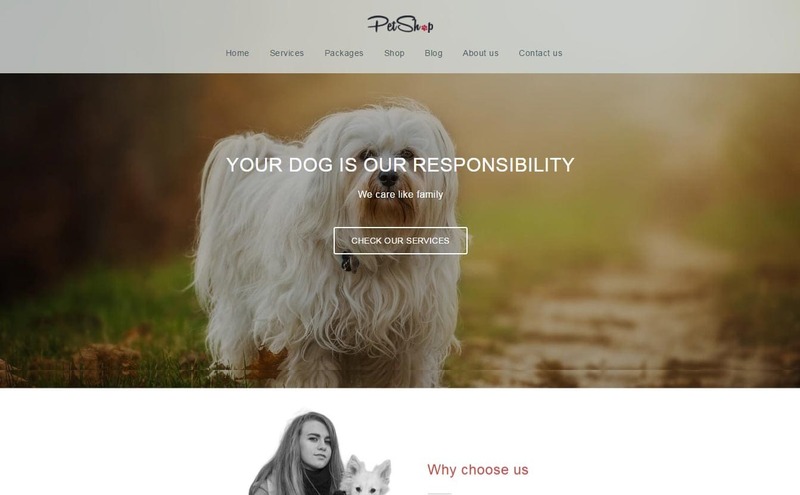 PetShop is a free WordPress theme suitable for Veterinary Doctors, Pet Consultants, Pet Sellers and other pet related websites. 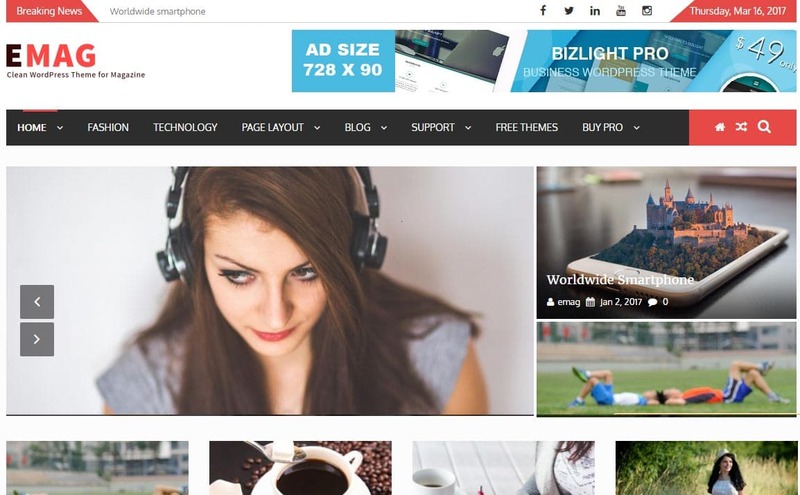 Businessx is a free WordPress theme ideal for any business. It has awesome design with unlimited possibilities, SEO optimized, WooCommerce ready and more features to explore! Out of the box designs are eye-catching. Oblique has a unique and modern design. Slanted lines make an elegant look with perfect spacing and beautiful typography. 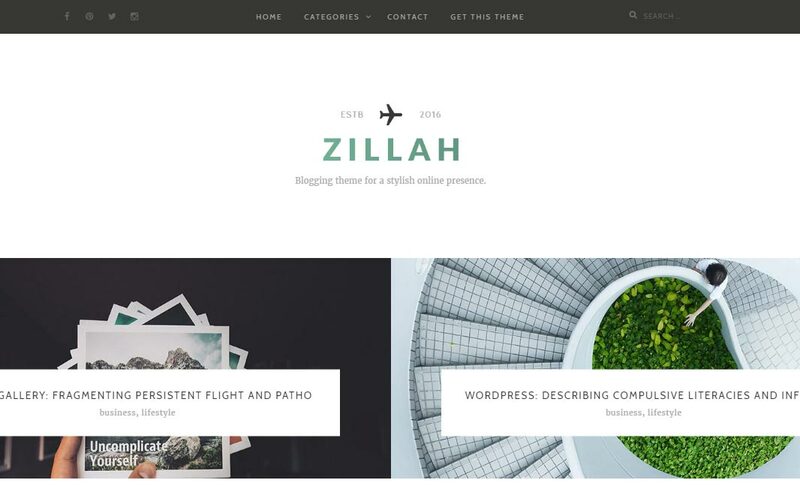 Zillah is a WordPress blog theme built with SEO structure. Just drag and drop elements to build your website in minutes using Zillah. Spacious is a WordPress theme ideal for any business you use it with. Spacious follows best SEO practices, optimized for speed, WooCommerce ready and has many features you need to see. 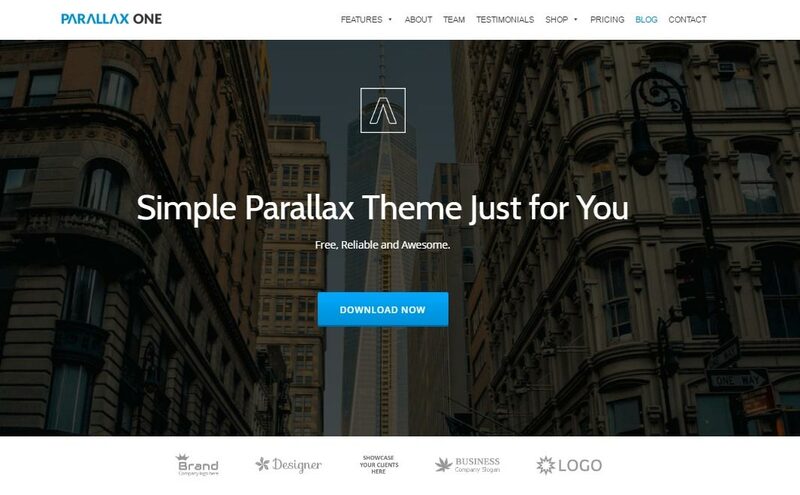 Parallax One is a WordPress theme with a smooth parallax effect. Parallax One is suited for any type of business you want to use it with. The theme is fully responsive, has unlimited color options, Woocommerce ready and is optimized for speed. 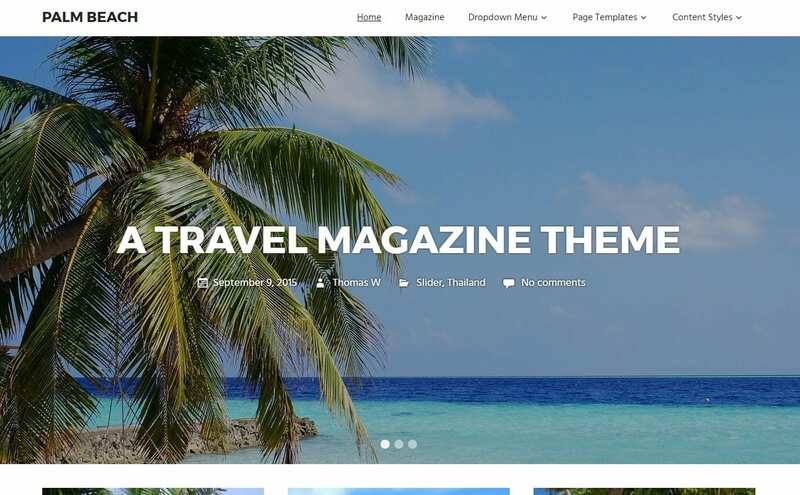 Palm Beach is a free WordPress theme ideally crafted for travel magazine. 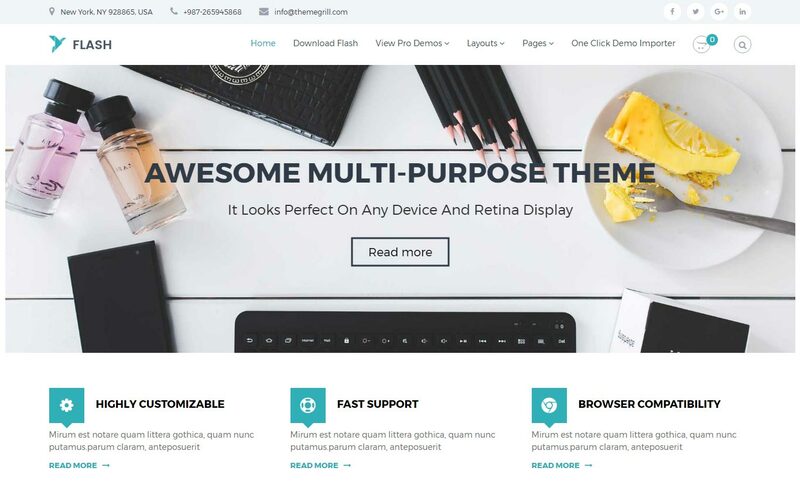 Take advantage of this beautiful theme that can carry your business to the next level. GK Portfolio is a stunning WordPress theme perfect for photographers, designers and artists. 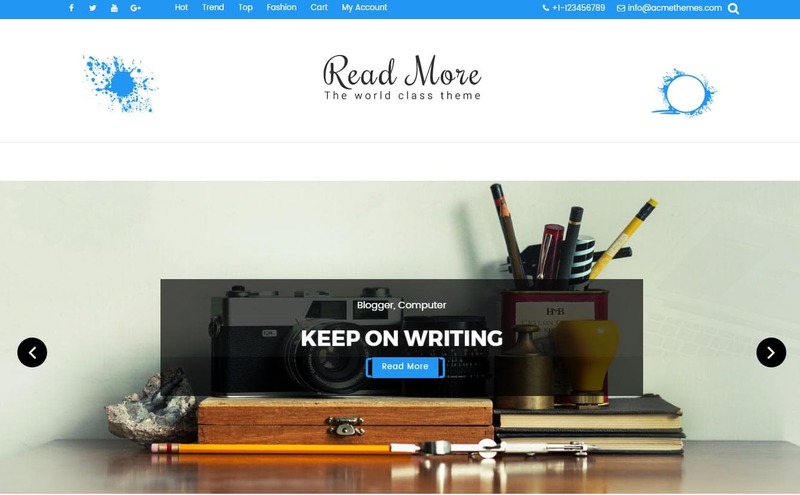 The theme will help you showcase your works in a simple yet elegant way. 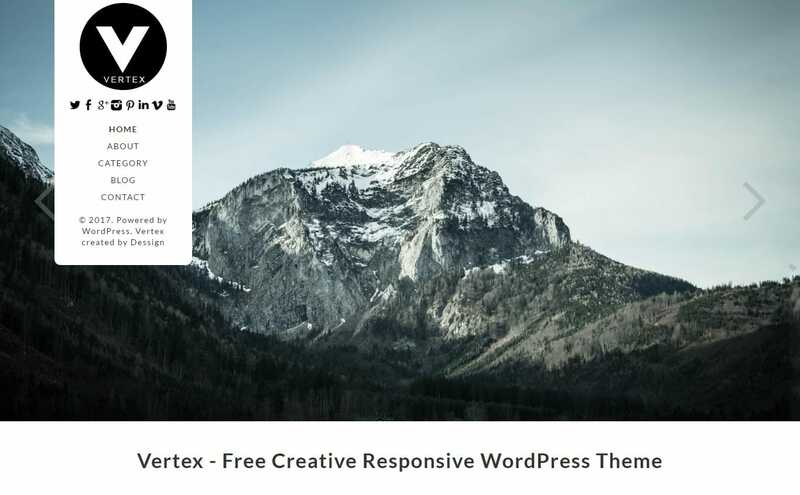 Vertex is a free creative responsive WordPress theme perfect for bloggers of any niche. Showcase your content in a modern and elegant style. 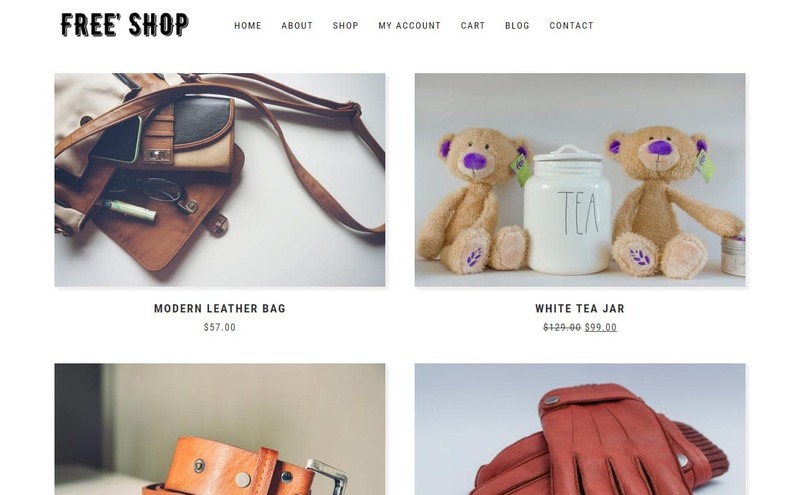 Free Shop is an e-Commerce WordPress theme with a clean and minimal design. It is ideal to use with any online shop you want to build. 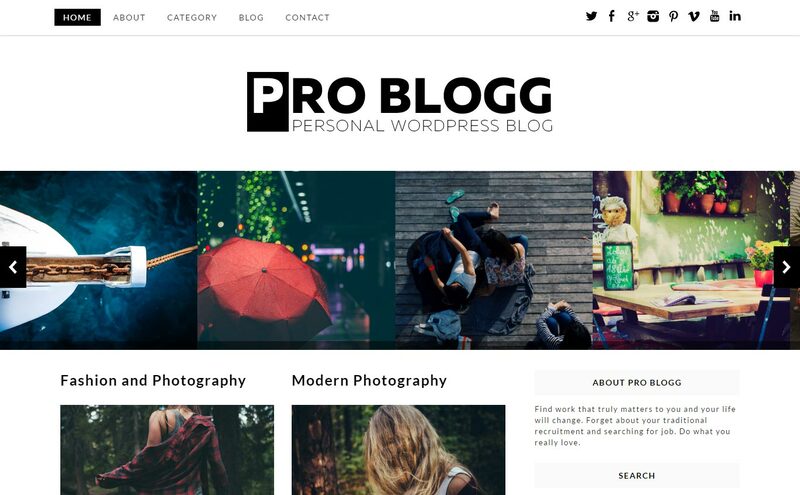 Pro Blogg is a WordPress blog theme perfect for bloggers. Either for fashion, photography, lifestyle, travel or any kind of blog you put up, Pro Blogg is a perfect choice. 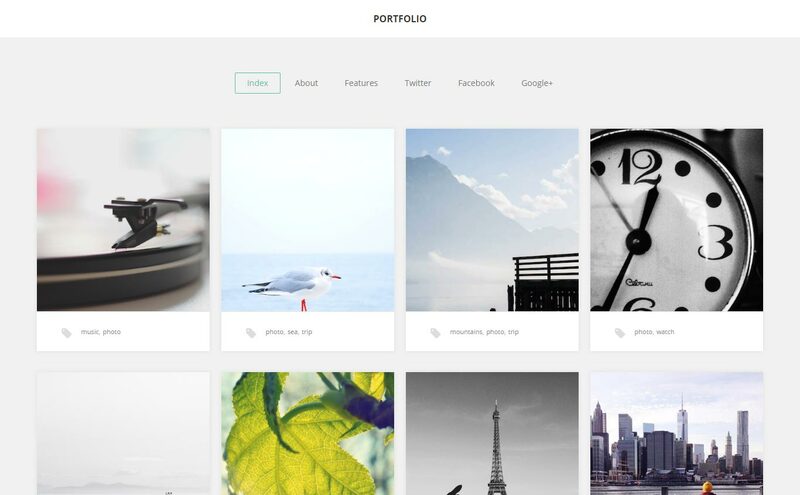 Photo Grid is a free responsive WordPress theme perfect for amateur and professional photographers who want to exhibit their creative works to prospect clients. 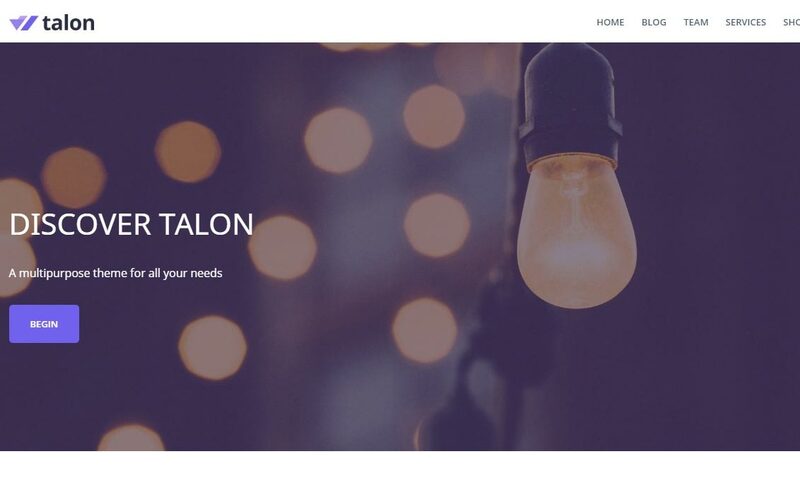 Talon is a free multipurpose business WordPress theme developed using the latest technology in the web. It’s ideal for freelancers, companies and other creative individuals. Flash is a free flexible multipurpose WordPress theme. Build your website simply by dragging and dropping elements with ease. Flash has animated number counter, blog, WooCommerce ready, optimized for speed and is SEO friendly. 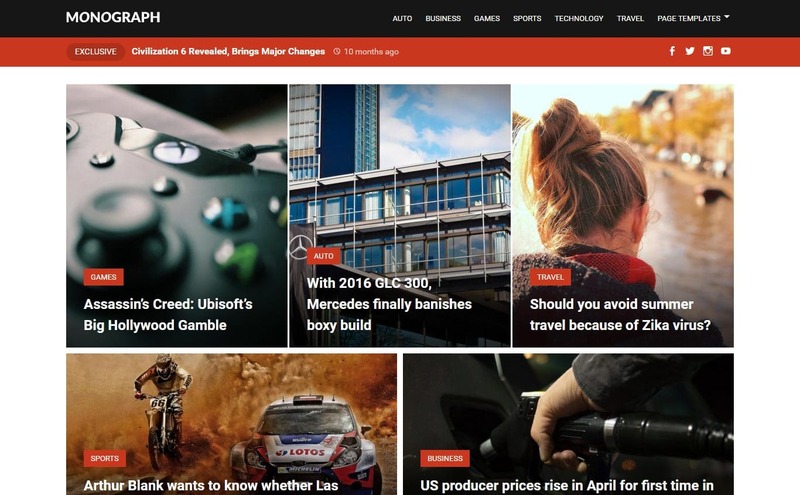 NewMag Lite is a free WordPress theme for online magazine and news websites. The theme provides most features needed to run a magazine and news site. Apart from that, NewsMag Lite has a clean design with multiple article layouts you can implement whichever suits your website best. 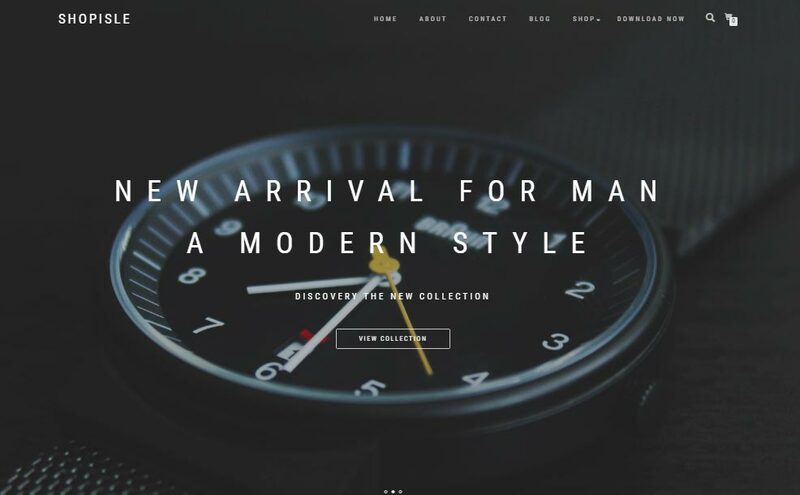 ShopIsle is a free eCommerce WordPress theme with stunning design. The theme is WooCommerce integrated, responsive and has an easy contact form. 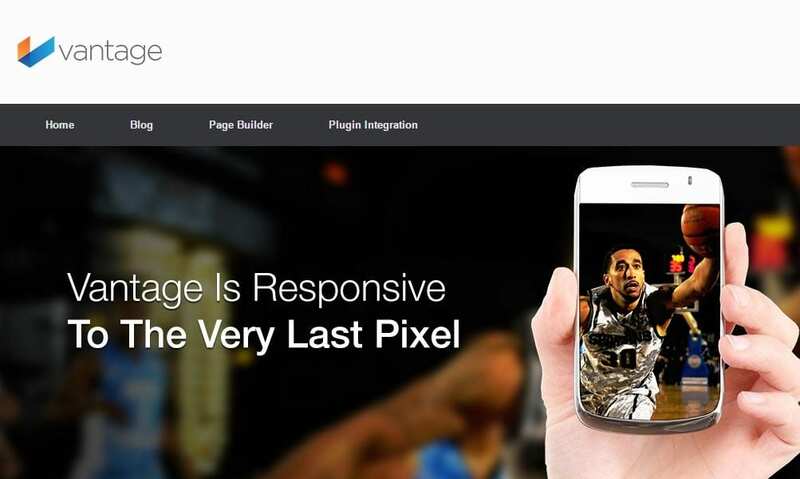 Vantage is a free multipurpose WordPress theme with a classic and modern design. The theme is WooCommerce integrated along with tremendous flexibility and is fully responsive. 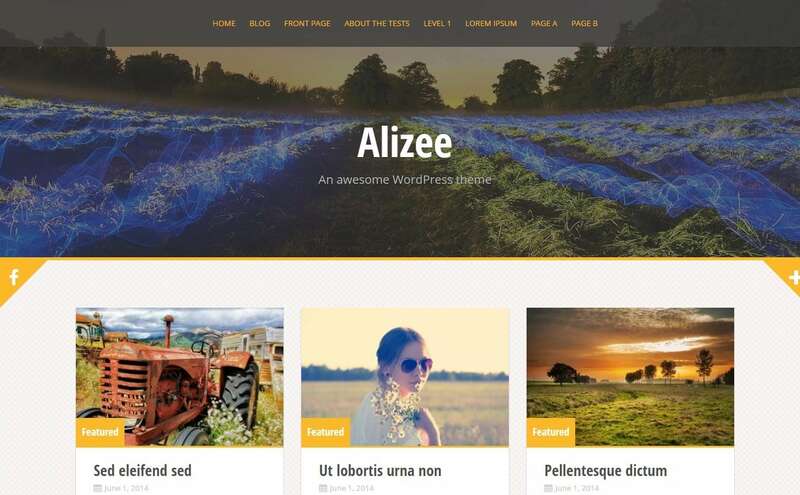 Alizee is a free WordPress theme ideal for blogging. 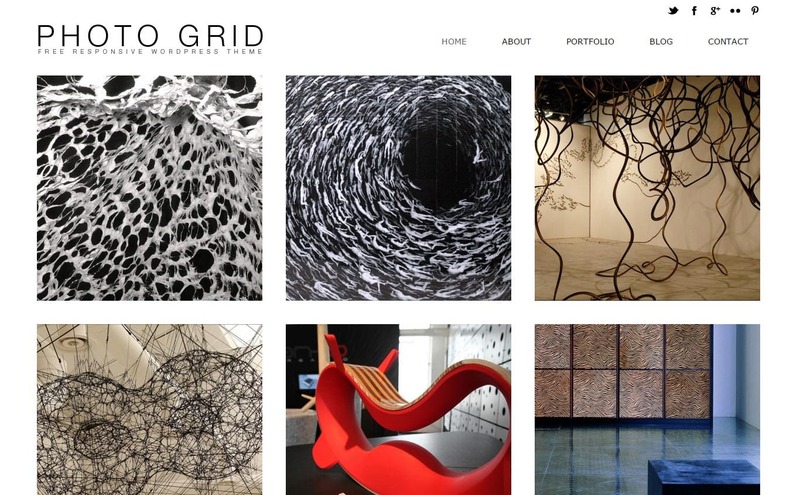 It is a grid-based theme with a fully responsive masonry layout or Pinterest-like. 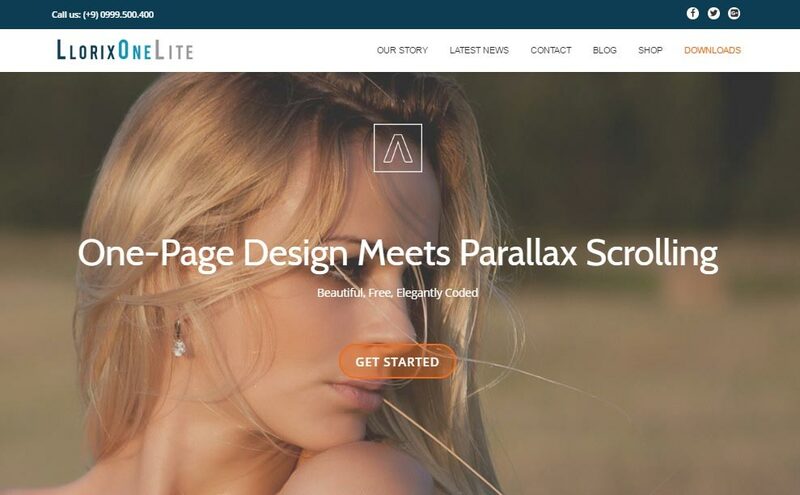 Llorix One Lite is a free WordPress theme with a clean and beautiful design. The theme features customizable ribbon, parallax scrolling combined with user-friendly interface. Bulan is a free WordPress theme with a classy and modern design perfect for bloggers. Whatever niche you want to pick for your blog, Bulan is a good choice. 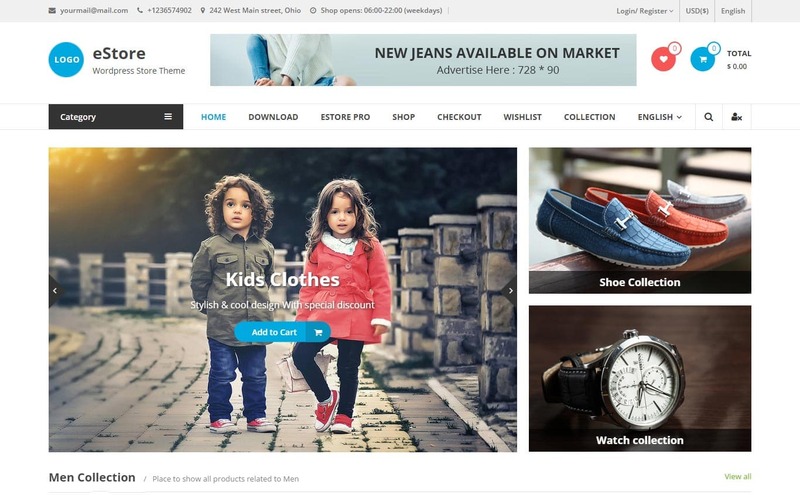 eStore is a free WordPress theme perfect for eCommerce website. You may check the demo to see how beautiful the theme works. 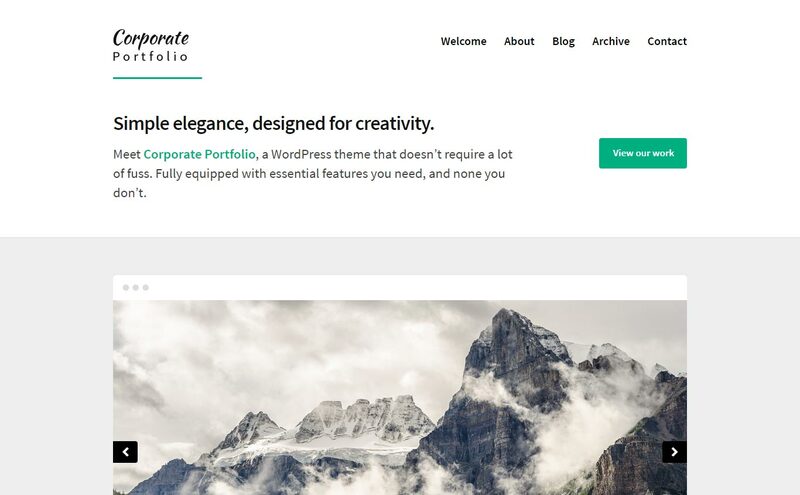 Corporate Portfolio is a free multipurpose WordPress theme designed for portfolio management. Showcase your works with style and elegance using corporate Portfolio theme. 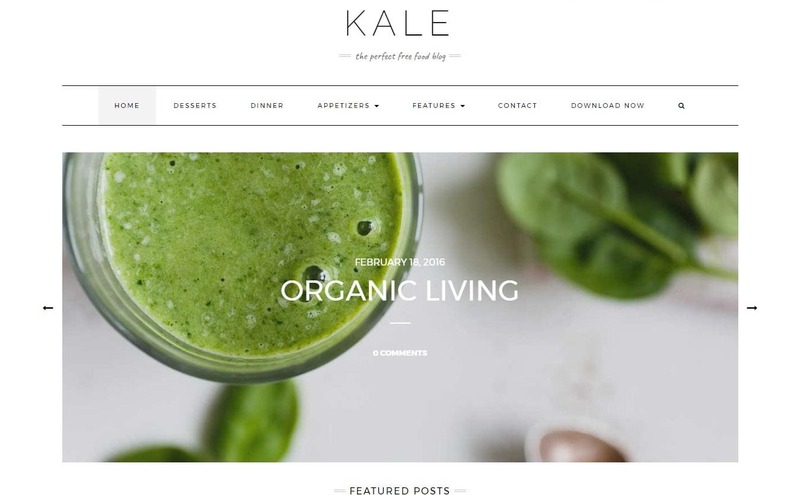 Kale is a free WordPress theme ideal for food blog. The theme has a super clean design that comes with bunch of beautiful features you and your readers would love. It’s also ideal for personal blog, lifestyle and recipe blogs. 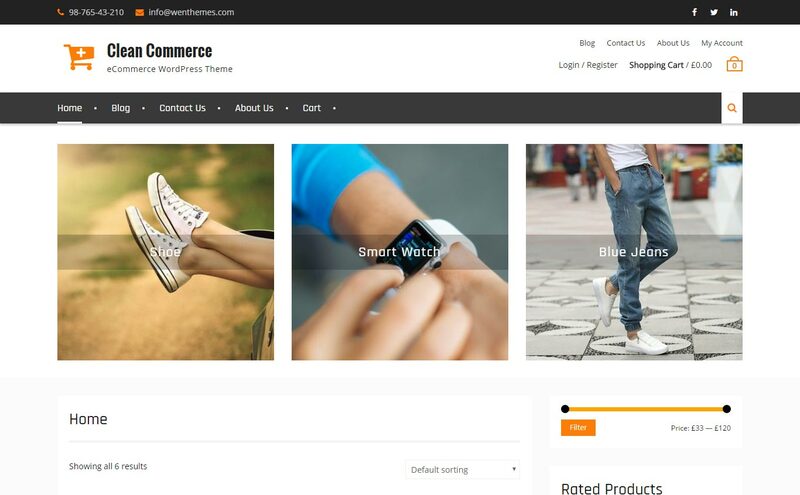 Simple Store is free WooCommerce WordPress Theme suitable for eCommerce websites of any store type: fashion, sport, technology, fashion, furniture, digitals etc. It is a complete eCommerce package with all required features and functionalities. Clean Commerce is a free e-Commerce WordPress theme with clean and minimal design. Clean Commerce is WooCommerce integrated so you can manage your shop easily and smoothly. 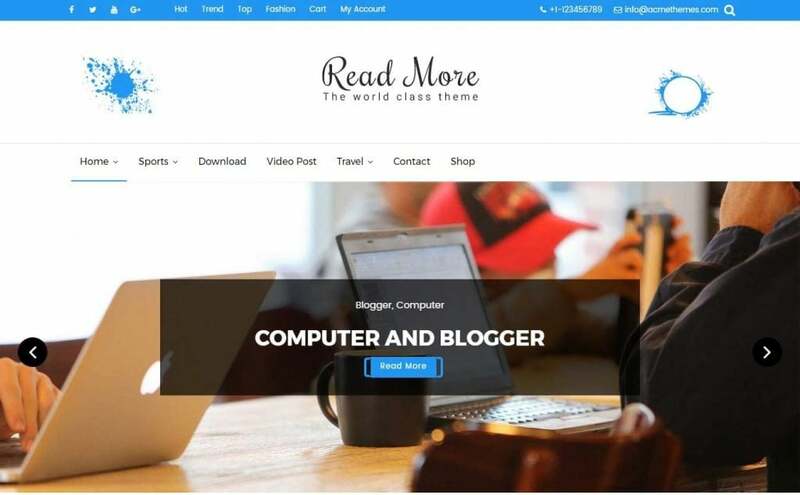 Read More is a free WordPress blog theme with modern design. The theme is fully responsive, SEO friendly, and super flexible. It’s ideal for personal blog or corporate blog. 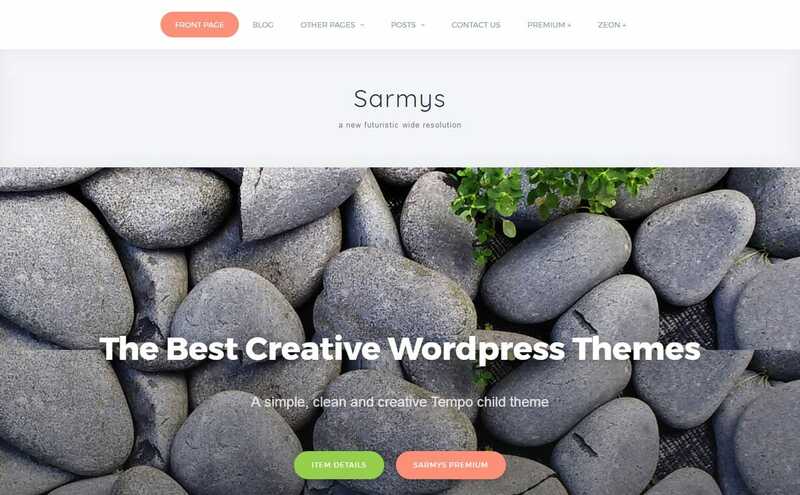 Sarmys is a free multipurpose WordPress theme with a simple and clean design. 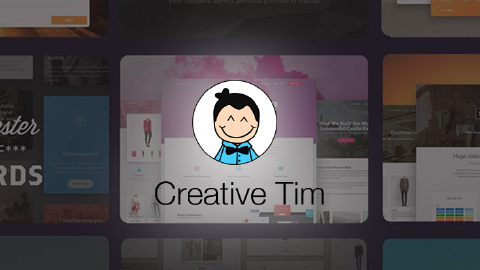 The theme is ideal for creative startups, photo blogging, graphic designers and other artistic domains. eMag is a free WordPress theme suited for Online News, News Press, Magazine or any publication website. It comes with features necessary for magazine sites like ample advertisement location, featured news, fanpage and a lot more! Monograph is a free WordPress theme ideal for modern blog/magazine. 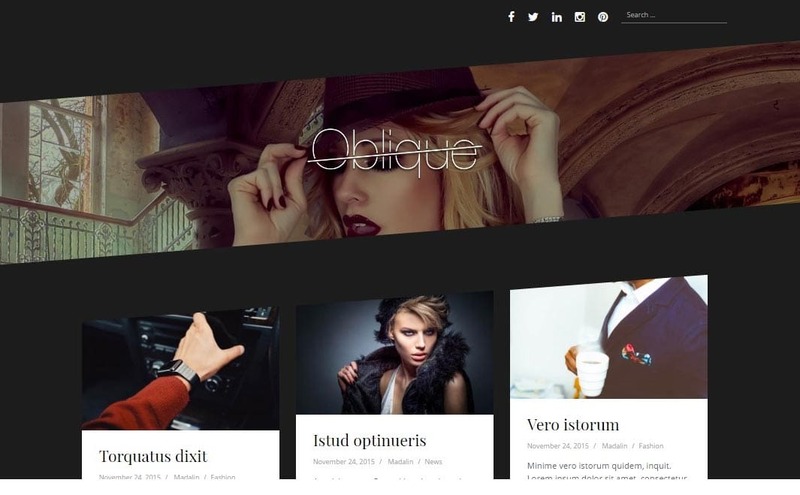 Magazine Plus is a free WordPress theme with sleek and attractive design. Make your magazine or news site extraordinary and sophicticated with Magazine Plus. 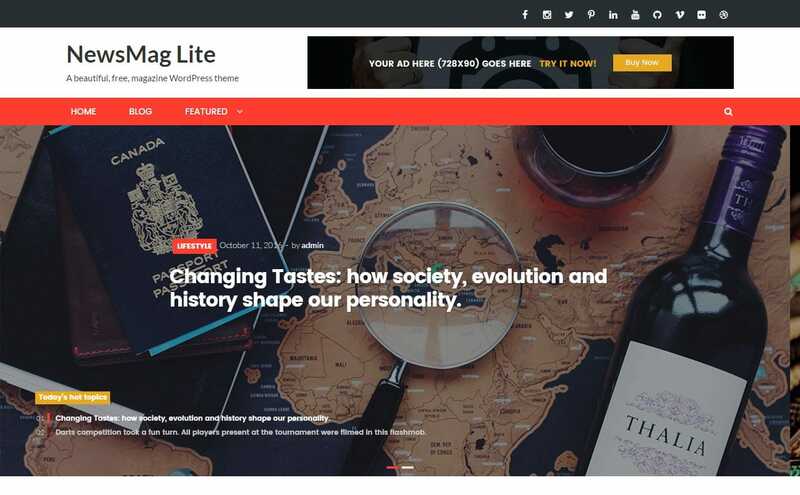 Marlin Lite is a free WordPress theme with cclean and modern design. 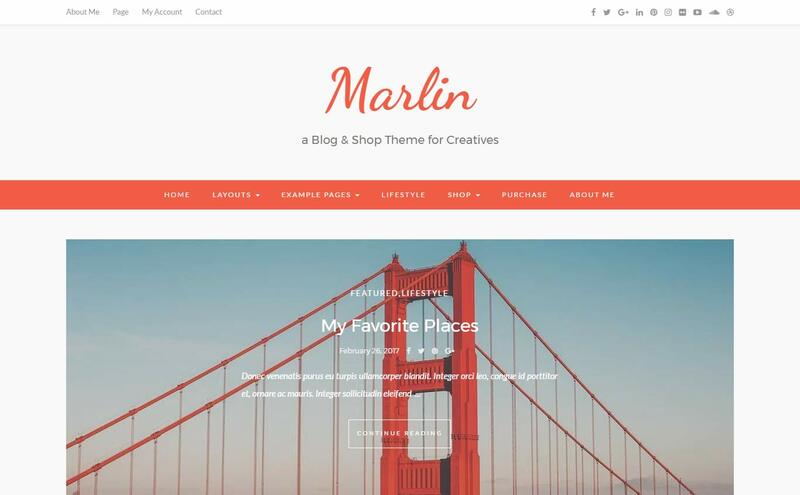 Built using Bootstrap framework Marlin Lite is perfect for creative bloggers, personal blog, photographers, and other professional website. 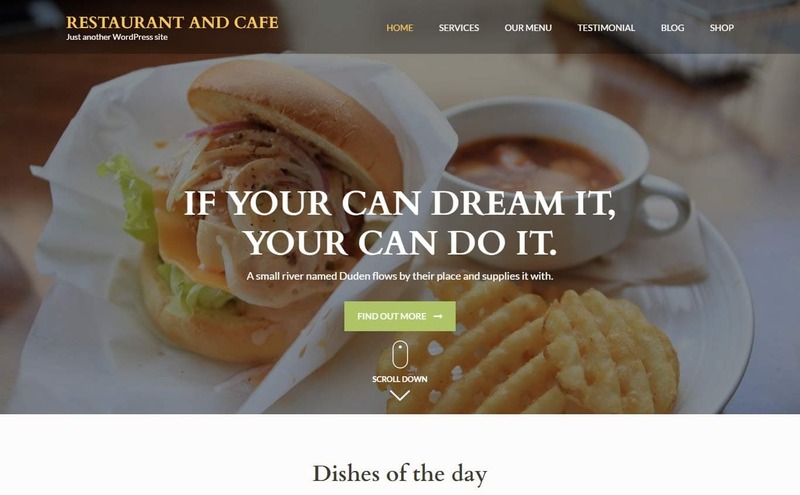 Restaurant and Café is a free WordPress theme ideal for restaurant and café websites. The theme is fully responsive, SEO optimized and speed optimized. 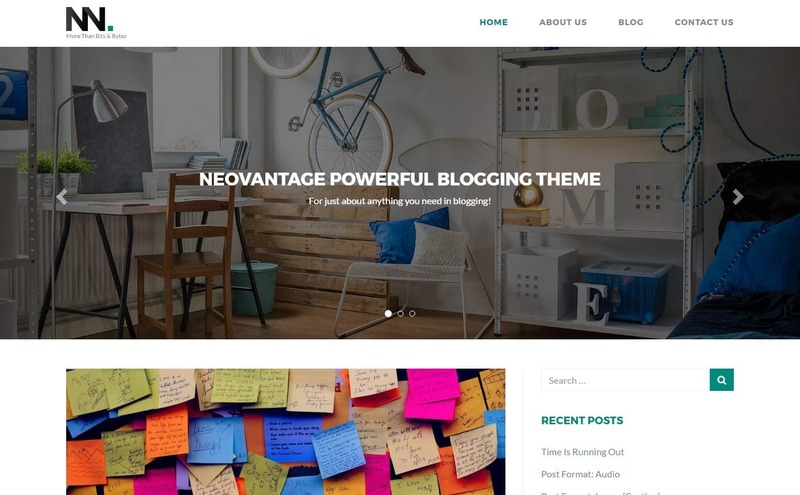 Neovantage is a free WordPress theme with sophisticated design suitable for bloggers of any niche. 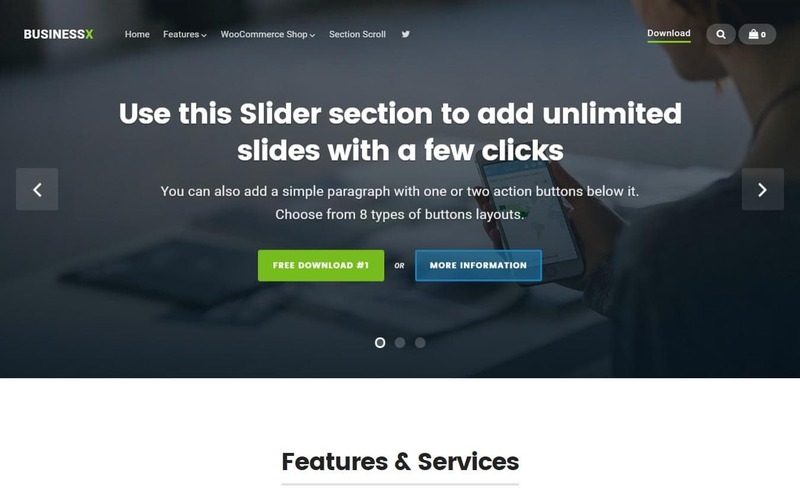 Nikkon is a free multipurpose WordPress theme with clean and simple design. Nikkon works great for a simple personal blog, photography portfolio, or a full eCommerce online store by simply installing the free WooCommerce plugin. 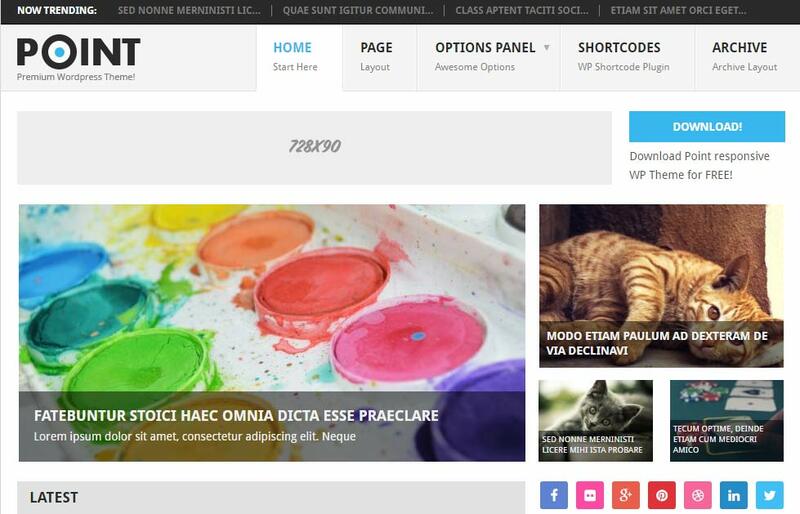 Orsay is a free WordPress blog theme with a light and bright design. 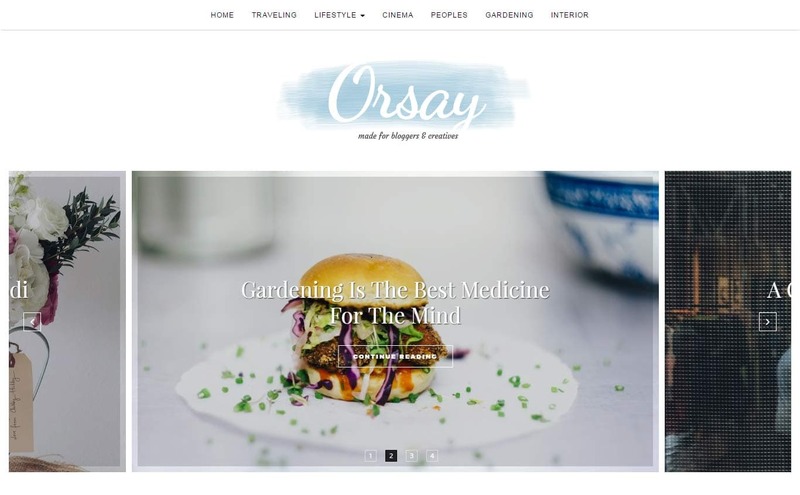 Make a super clean blog for fashion, travel, personal or lifestyle in an instant with Orsay. 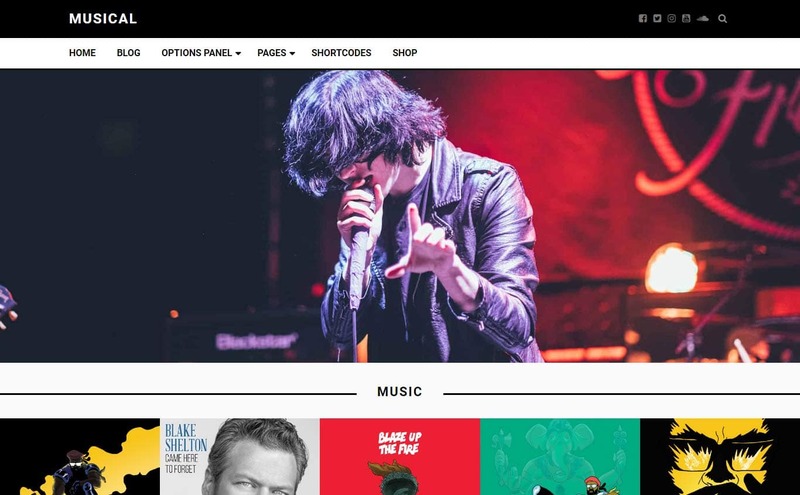 Musical is a free WordPress theme ideally crafted for a broad range of show business. Musical is perfect for entertainment bloggers, musicians, music bands and DJs who needs to exhibit their entertainment services or products worldwide. The theme comes with numerous customizable features and powerful options that allow you to create a vibrant entertainment site. Point is a free WordPress theme perfect for bloggers of any type. 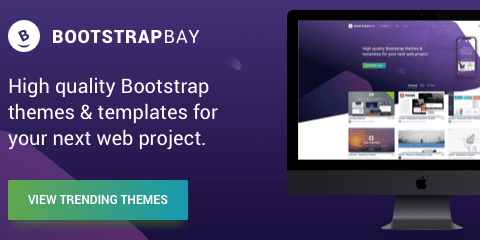 It’s a multipurpose theme with advanced options panel, you can choose from multiple site layouts, backgrounds and color schemes, as well as control specific features of the theme. Clean Education is a free WordPress theme developed with features all necessary for education websites. The clean, simple and user-friendly design of the theme will make your website more than a mere education website. 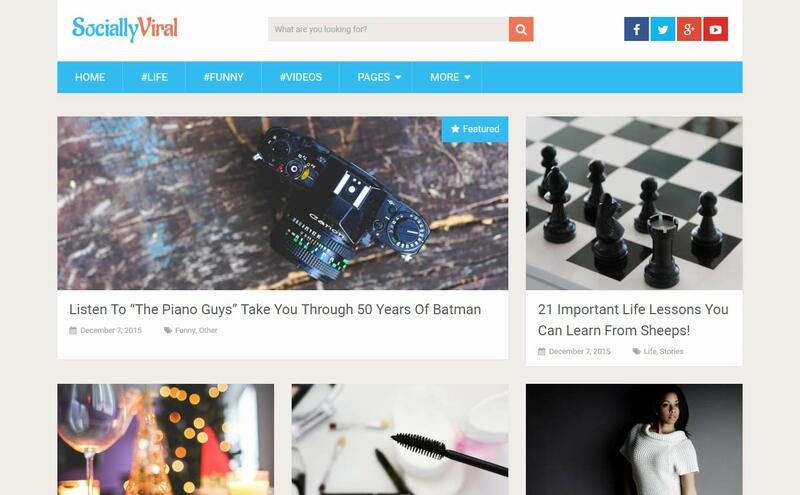 SociallyViral is a free WordPress theme aesthetically designed to increase social sharing. The theme comes with features to help you get more traffic through social sharing also boost search engine rankings. 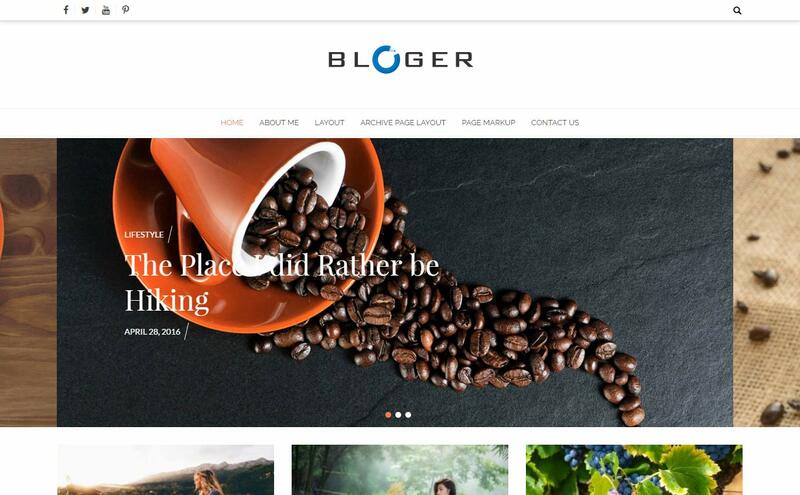 Bloger is a free WordPress blog theme with a simple and clean design. Either for personal or professional blog Bloger will always make your website extraordinary! 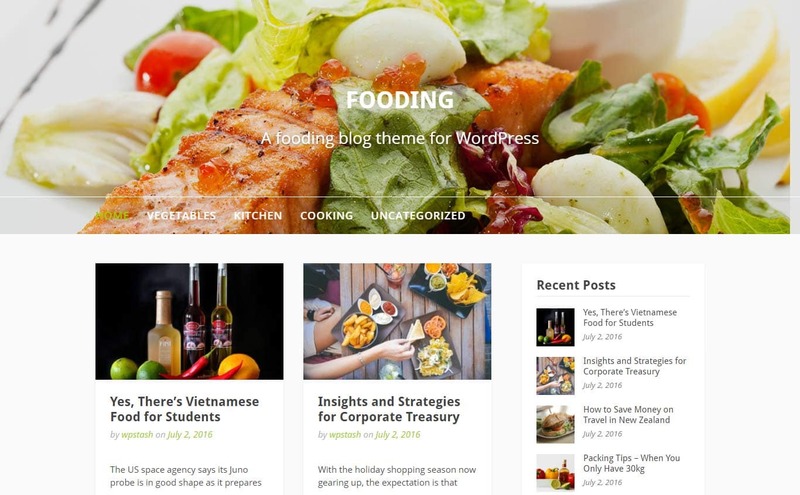 Fooding is a free WordPress blog theme developed to help you build an awesome food blogging site in minutes. The clean and neat design will always attract visitors. 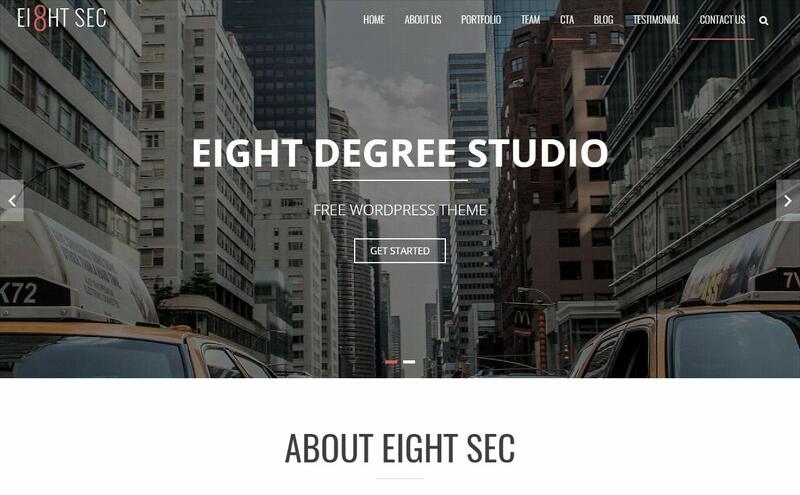 Eight Sec is a free WordPress theme with eight sections. 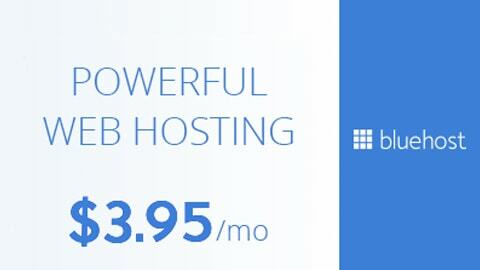 It is ideal for business, corporate, portfolio, blog, agency, freelancer and any other modern and creative website. 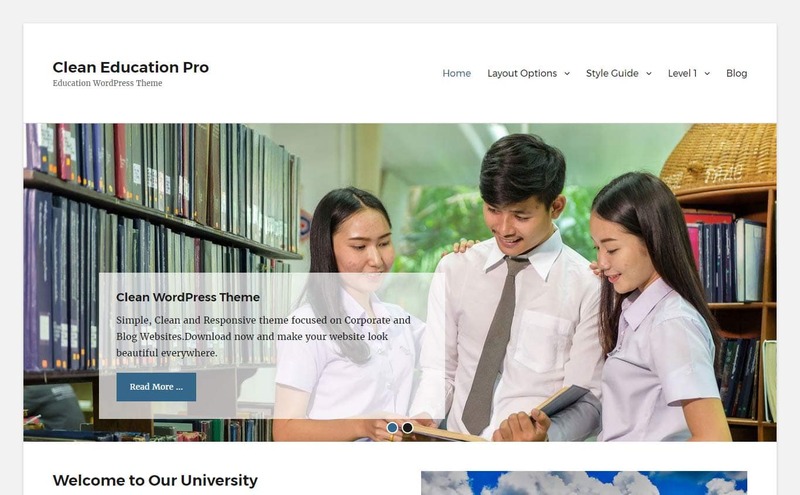 Education Base is a free WordPress theme with modern and colorful design. 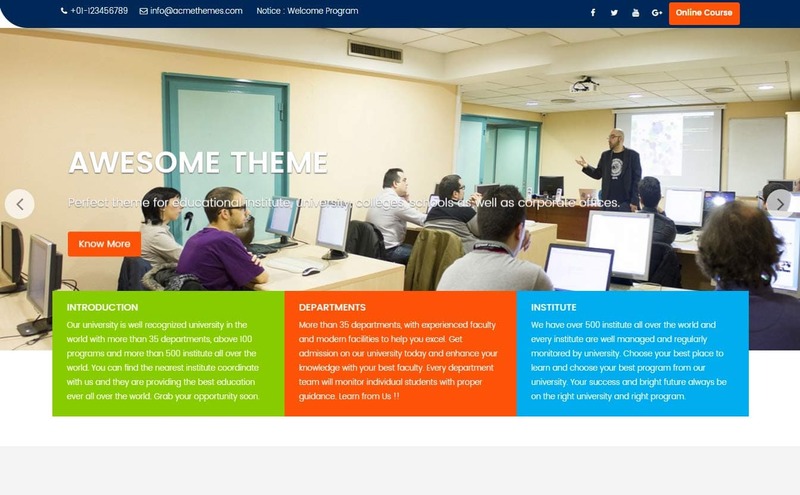 This theme is built with several features of all educational institute websites including universities, colleges, schools and others. Education Base can be also used for business and corporate websites or one page sites. 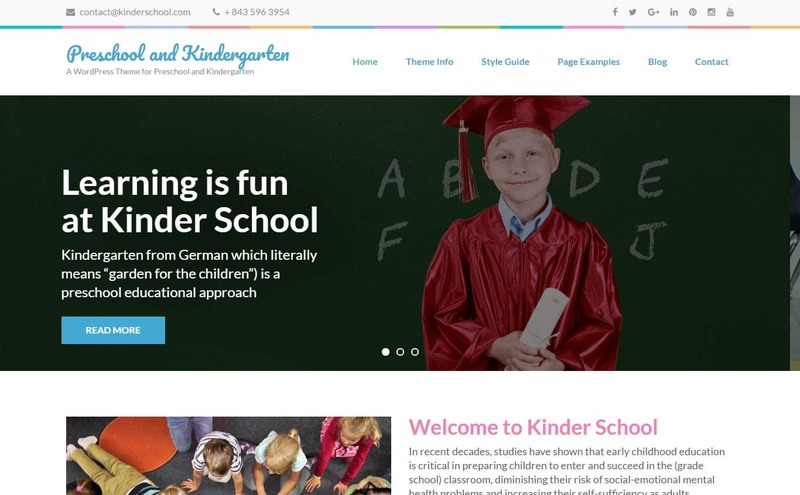 Preschool and Kindergarten is a free WordPress theme perfect for Kindergarten, Schools, Elementary, Primary Schools, Secondary School, Universities, Academics and Educational institutions.